Weekend Guide | Club Dine In! 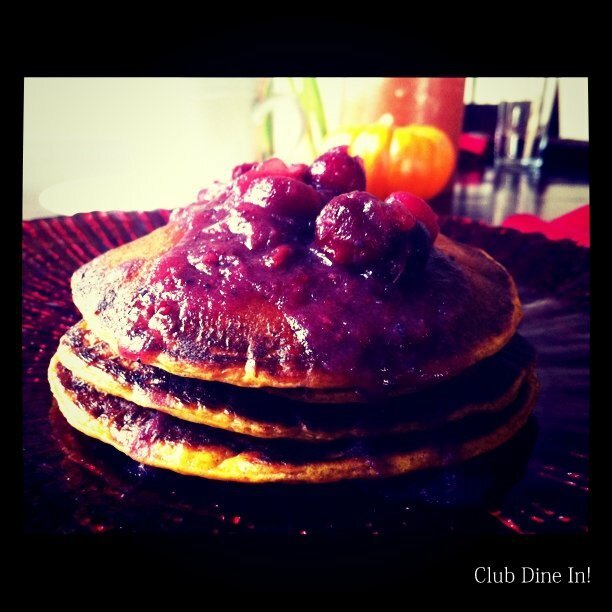 Posted on November 18, 2010 by Club Dine In! I have been working on producing SF’s first Pancake and Music benefit for the last 1.5 months and it’s finally this weekend! Friday night, guests will enjoy and dance to world musicians performing live. Coda will have their dinner menu available and guests can reserve a table in advance. 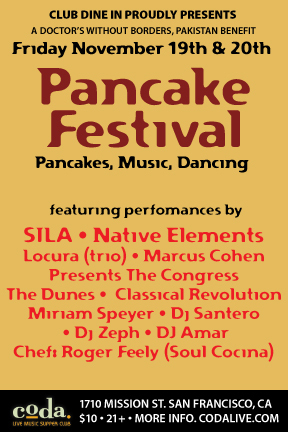 On Saturday, we will serve organic, sustainable pancakes buffet-style while bands play on stage. Tickets are only $10 for each day and 100% of the sale goes to Doctor’s Without Borders, Pakistan. We really need volunteers to make this event successful. We need volunteers to flip pancakes and man the buffet station. If you are interested, please contact me as soon as possible. More information: http://pancakefest.eventbrite.com/ This is a Club Dine In! event and I hope to see you there! In the spirit of an active lifestyle, we wanted to feature Pinchd – San Francisco’s only insider activity guide. If you are tired of the same old corner bar or just want to find something fresh to do, check it out. You will definitely be inspired by all the secret gems and adventures that San Francisco has to offer! Every adventure is created and ranked by people like you. So start with checking out Pinchd’s afternoon adventure guide dedicated to exploring the Mission here. Food lovers, get your taste buds ready for the November 18th installment of NightLife. In partnership with KQED to present you with a night filled with foodie films, tastings and demonstrations. Music by Jeff Stallings. “A Taste of NightLife” will pair food films The Botany of Desire and Black Gold with live music and demos, presentations, and tastings by Tcho, Madecasse, 18 Reasons, and Hayes Valley Farm. Vanessa Barrington, author of the cookbook DIY Delicious, will provide hands-on instruction in making a spicy Korean kimchi, a sauerkraut with cabbage and root vegetables, and Salvadorean curtido. Participants will take home their own starter kimchi and their choice of curtido or sauerkraut. Get crafty at the Winter Carnival booths. Performances by local musicians and a mega mix of skating, dancing, and songs from Disney on Ice’s Worlds of Fantasy blast off at 6 p.m. at the Holiday Ice Rink. All the festivities lead to 17,000 dazzling lights of the Embarcadero towers illuminating the skyline. Fri., 4 p.m. – 7 p.m., San Francisco, free. Join Club Dine In!, SILA, and friends for a night of live music, food and dancing. Coda will serve their regular, seasonal menu while local bands play world music. Tickets are only $10 and 100% of all ticket sales will benefit Doctors Without Borders, Pakistan. Enjoy brunch differently. Pancakes made from local and organic ingredients, topped with fresh fruit and chocolate with live bands and dancing. All for $10 all of the money goes to a charity. The menu includes pumpkin, buttermilk, and chocolate chips pancakes. Toppings include local pears, apples, and date compotes, dulce de leche and caramel sauce. Volunteers needed to make this benefit successful, contact me right away! The San Francisco Hip Hop DanceFest remains unique for its dedication to presenting the highest quality professional Hip Hop dance companies and for its forward-thinking curatorial focus. This legendary event offers professional Hip Hop dance companies the level of production, exposure, and acknowledgment that they urgently deserve, nurturing emerging artists and consistently contributing to the evolution of both Hip Hop and dance. With a record of ten years of sold-out performances, the DanceFest has developed a reputation for both quality and innovation.